Real Madrid showed the World how to beat the best Barcelona team in History. A 1-0 victory, obtained in extra time thanks to an amazing goal from Cristiano Ronaldo, granted Real Madrid their 18th Copa del Rey. José Mourinho proved why he is the best tactician manager in football. "El Clasico" Round 3 and 4 will now take place next week, for the UEFA Champions League semi-finals. 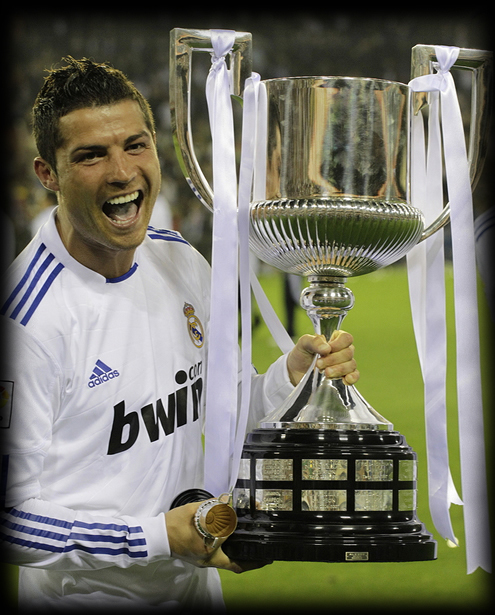 Real Madrid and Cristiano Ronaldo won the 18th Copa del Rey in the club's history, aftear beating Barcelona in extra-time, in an epic game played in Valencia. CR7 scored the winning goal, after finishing a great cross by Di Maria, with a glorious header. The tiki-taka was finally defeated by the "Special One" and Real Madrid seems to have found the antidote to the Barcelona passing style game. This game can probably also put a stop to a non-sense myth: Cristiano Ronaldo can be a decisive player in the most important matches. Real Madrid signed José Mourinho to win titles and, ten months later, the Portuguese coach showed why he is seen as the best manager in the World, by defeating Barcelona by 1-0, in the final of the Copa del Rey, after the club have been missing this trophy for 17 years in a row. All those who thought José Mourinho's style was not enough to defeat Guardiola's team, should now look the other way and reckonize that it was probably the only way to do it. The squad tossed Mourinho in the air, in celebration at the end of the game, because they know how just how much they owe him. This match had nothing to do with Saturday’s Clasico that ended up with a 1-1 tie. Intensity took over from the start, with Pepe battling in midfield, Ozil as a winger and Cristiano Ronaldo upfront playing as a number 9. José Mourinho's men took the initiative against a Barcelona side with doubts and surprised by Real Madrid's initial strategy, who kept pressuring for the entire first half of the game. Barça hardly kept possession and the "Merengues" focused on reaching Pinto's goal in as few passes as possible. Real Madrid constantly stole the ball from Barcelona in midfield and Mesut Ozil had the first chance in the game with a shot that grazed one of the posts around the 18th minute. Both squads played to the limit and the referee was kept busy. Cristiano Ronaldo had a shot on target that was saved by Pinto around the 27th minute, and another a few minutes later in the 32th minute. Barcelona then tried to ease the pressure any way they could as they didn’t feel comfortable with or without the ball and just didn’t know how to put a stop to Real Madrid's frantic pace. The clearest chance in the entire first half was also caused by Real Madrid, after Mesut Ozil served a great curved cross into the small box and Pepe headed it beautifully, only the ball hit the near post. Incredibly, Real Madrid didn't manager to score a single goal in the first half, despite many chances being created and half-time arrived with score remaining 0-0. Barcelona showed a different attitude in the second half and that was shown with a better positioning stance and a longer ball possession. However, Real Madrid didn't give up and kept blocking open spaces, chasing the ball and marking every opponent like if their lifes depended on it. Barça had their first shot on goal around the 51th minute, which pretty much says how competent Real Madrid was in defensive tasks. José Mourinho pulled the team back slightly and looked to score from long passes to surprise both Gerard Pique and Javier Mascherano and make good use of the speed of Cristiano Ronaldo, Mesut Ozil and Di Maria. Barcelona started to push more upfront and Real Madrid was showing clear signs of exhaustion, mostly because of their efforts in the first half. The referee then decided to disallow a goal by Barcelona, because Pedro was offside, which was probably the right call. José Mourinho decided to replace an exhausted Mesut Ozil with Adebayor. Barcelona started to put even more pressure on the "Merengues" and had shots on target through Messi and Pedro, but Real Madrid's captain, Iker Casillas, pulled rank to save the day many a time, showing the World he can also be seen as one of the greatest goalkeepers of the last decades. The regular time was over and the goaless tie leaded the game to overtime. Barcelona continued to keep possession in the opening minutes of extra time, with Real Madrid playing close to each other and looking for a swift and solid counterattack, as most of the players were very tired. Cristiano Ronaldo had a great chance from a crossed shot in the 98th minute and missed by a few inches. However, the big moment arrived a couple minutes later, after Marcelo stole the ball from Barcelona and passed it to Angel Di Maria. The Argentine served a phenomenal cross inside the box and Cristiano Ronaldo headed it into the back of the net, in a tremendous strike, just before half-time, putting Real Madrid 1 goal up. Guardiola replaced David Villa with Affelay in the second half. In the other hand, Real Madrid just had to resist for another 15 minutes and the title would go to the Bernabéu museum. Guardiola’s team kept possession, but hurt from the conceded strike, had no chances to score whatsoever. Real Madrid covered every single open space and crack in their lines driving Barcelona to a great despair. An exhausted Di Maria was sent off, but it didn’t matter anymore as the game was close to the end. The referee blew his whistle and the Mestalla Stadium erupted. All Real Madrid players hugged each other, ran and jumped around the pitch. Everyone simply went crazy. The Copa del Rey will finally return to Madrid, after 17 years and Cristiano Ronaldo showed once again why he is regareded as the most complete football player in History. Remember that you can watch Valencia vs Real Madrid livestreams, for the Spanish League, online here on ronaldo7.net, this Saturday. Cristiano Ronaldo should be fit to play.